Starting from today the investors of the Estateguru portal can use the Auto Invest application to make an investment. After activation the application invests the funds on the virtual account of an investor independently in new projects to the extent permitted by the investor. Making investments with the application can be denied and reactivated at any time. Already completed Auto Invest investments can not be cancelled. The application cannot be used and it is deactivated if the virtual account of the investor does not have sufficient funds. The minimum amount of the investment must be EUR 50 in order to use the Auto Invest application. No maximum amount of the investment has been established for using the Auto Invest application. We would like to draw your attention to the fact that the application makes decisions on involving investors on the basis of an algorithm. The activation of the Auto Invest application does not provide an investor with a possibility to participate in each project announced after the activation of the application. Investor who has activated Auto Invest can participate also in each project using manual investing if there is availability for making additional investments after investments of Auto Invest have been distributed. In the event of the multiplicity of users of the Auto Invest application or small-scale projects, the amount of investment contributions proposed by the users of the Auto Invest application may turn out to be larger than the loan amount specified in the project. The increase in the maximum amount of an investment permitted to be made by the Auto Invest application does not always guarantee that the investment is made to the respective extent. In the event of multiplicity of investors or a smaller loan amount applied for, the application may also calculate a smaller amount for the investment. The application prefers investors who have set that the amount of investment is the minimum amount of investment. Additional criteria (minimum interest rate, loan amount, term, etc.) can be set by activating the application, after which the application does not only invest on the basis of the algorithm, but also considers the criteria set by the investor. The prerequisite for using the criteria is the amount of investment of at least EUR 500. Selektionskriterien darf man aber erst ab 500€ Gebotsgröße auswählen. Für mich uninteressant zwecks Diversifikation. Ansonsten aber bestimmt praktisch. Prinzipiell ist der Auto-Invest sehr praktisch. Ich vermisse nur die Möglichkeit, auf den Rang eines Darlehens zu filtern. Diese Funktion fehlt definitiv. Ich investiere grundsätzlich nicht in nachrangige Darlehen. Außerdem finde ich die 500er Grenze sinnfrei. Werde ihn daher nicht nutzen. Also bei mir hat der Autoinvest schonmal nicht funktioniert. Ich war evtl. aber auch etwas zu ungeduldig. Es lag Geld auf dem Konto, Autoinvest war aktiviert und es gab einen offenen Kredit (habs auch mehrfach an und abgeschaltet). Nach knapp 2 Tagen hab ich dann doch manuell investiert. Keine Ahnung wann im Hintergrund der Trigger läuft per Autoinvest zu investieren. setzen zu können ist für mich ein KO Kriterium, das ist mir einfach zu viel. Ohne Zinsgrenze aktivier ich den nicht. drei Projekte waren schneller voll als ich klicken konnte. wollte, sondern weil ich als "Kleinanleger" deutlich benachteiligt bin. Stand heute sind 7 Zahlungen bei mir überfällig. Es ist nichts zu erkennen, was EG dagegen unternimmt. Mails bleiben unbeantwortet, statt dessen gibt man munter weiter Kredite an die säumigen Zahler. Auch wenn verspätete Zinsen nur Kleinvieh sind, lege ich meine Investitionen dort erstmal auf Eis. Es grenzt ja schon fast an ein Wunder, wenn die Zinsen mal pünktlich gezahlt werden. Finde ich absolut nicht in Ordnung. 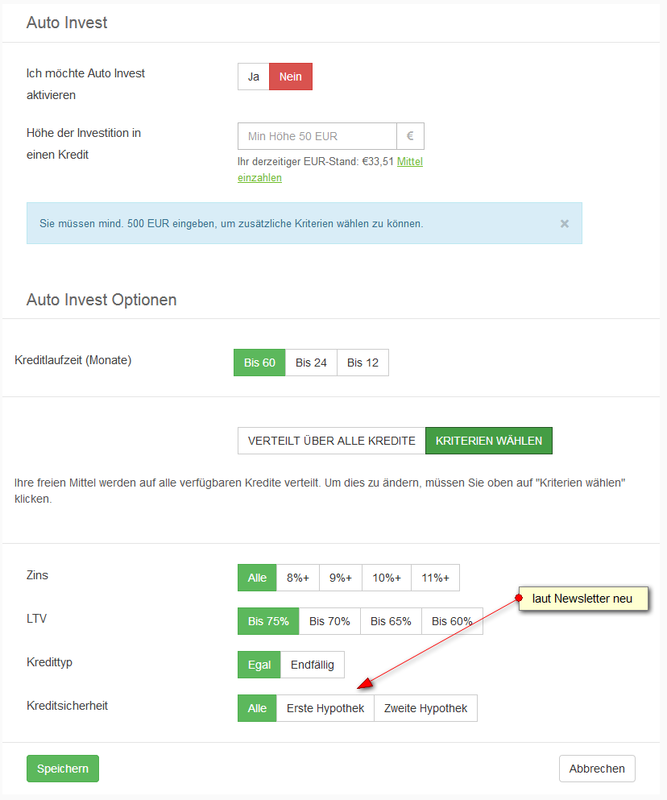 Laut Newsletter gab es ein Upgrade beim Estateguru Autoinvest. Ich habe jetzt auch mal Autoinvest probiert und der erste Kredit ging prompt schief. Oft kommen Kredite in mehreren Tranchen. Wenn ich in Tranche 1 dabei bin, lege ich nicht mehr nach in Tranche 2 oder 3. Jetzt hat allerdings der Autoinvest in Tranche 2 investiert wo ich schon in Tranche 1 investiert bin. Es gibt beim Autoinvest nämlich keinen Parameter um mehrere Investitionen in ein Projekt zu vermeiden. Ich hatte nicht aufgepasst und nicht genügend nachgedacht. Ich habe auf jeden Fall den Autoinvest sofort wieder gelöscht. ◾You can now choose if you want to invest into staged loans with Auto Invest or not (for example Laineoru development loan phases 1, 2, 3, 4). A staged loan is one bigger project divided into smaller parts. This enables the borrower to have a more flexible payment schedule and to modify interest rates for later stages if need be. For example for the first stage, the base of the house is built, with the second the rooms and spaces are made and with the funding from the third stage the final decoration is done. ◾You can now choose if you want to invest in refinancing loans or not (For example Endo refinancing loan). Refinancing loans are made to get better terms from the loan provider in order to cover an older loan or to switch loan providers with the aim of getting better terms again. @Thep2pinvestor Das würde in Deinem geschilderten Fall zumindest helfen, wenn Du die Investition in mehrstufige Projekte ausschließt.